SCHWARZKOPF BC PEPTIDE MICELLAR SHAMPOO (1000ml) – HAIRDEPOT - Hair & Scalp Care Products, Prevent Hair Loss, Shampoo, Conditioner, Treatment, Styling, Appliances and more! 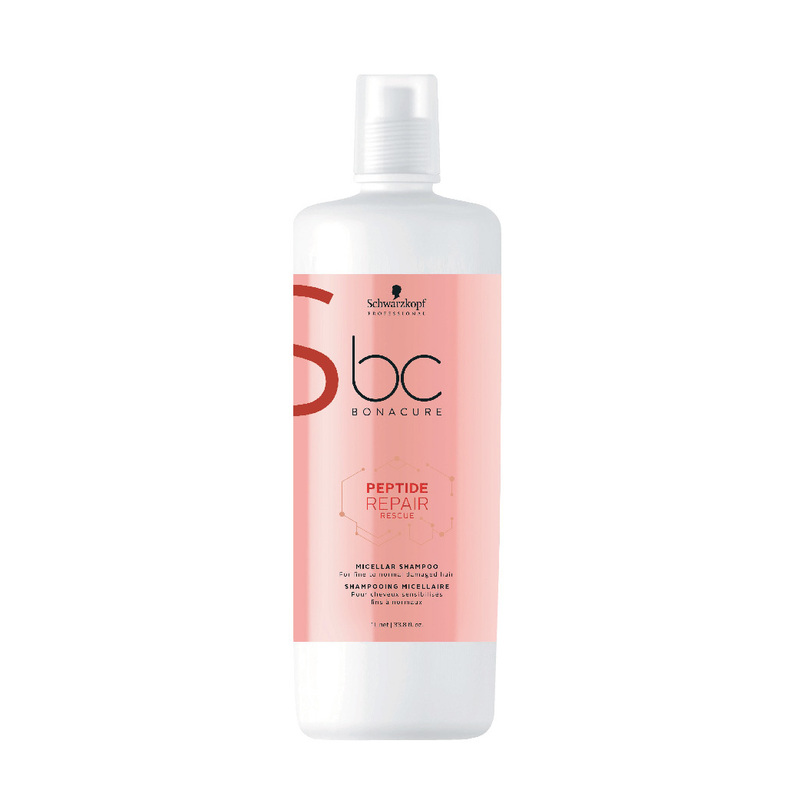 The BC Bonacure Peptide Repair Rescue Micellar Shampoo ensures that damaged hair is repaired from the inside and that the hair and scalp are cleaned. The hair is again healthy, strong and has a beautiful natural shine. The Peptide Repair Rescue Micellar Shampoo gently cleanses, leaving the hair feeling soft. The detangling of the hair is therefore easier and the condition of the hair is improved. The damaged hair is completely restored by the Peptide Repair Rescue Micellar Shampoo. Your hair is going to shine again! Formulated with a high concentration of Proteolipids for their strengthening properties, the unique blend of Peptides, Amino Acids and Keratin visibly transforms the hair, increasing shine and manageability. Cell Perfector Technology optimises hydration and restores elasticity, increasing shine and smoothness without adding excess weight. Apply the BC Bonacure Peptide Repair Rescue Micellar Shampoo to damp hair. Massage the shampoo in the hair for a few minutes. Then rinse the shampoo thoroughly.